Every abortion, by definition, destroys a human life. Obvious, isn’t it? Every abortion kills a person of incalculable worth. Obvious? Yes, but still hard to grasp. I keep some pictures in my Bible. I’ve kept them there for many years. They are photographs of real babies who were scheduled to die by abortion but whose lives were spared. They are beautiful. I also have photographs of real babies who were not spared but rather were brutally murdered in the name of “choice”. These pictures are hard to look at and pierce the heart. This is the reason that I keep them at hand, if perhaps I might have opportunity to bear witness to the stark reality of life and death, that for the most part is an abstraction, even in the church. One morning I had been reading the scriptures at my dining room table and having finished, closed and left my Bible there. I had gone off into another part of the house and returning a while later, entered the room with my daughter Victoria. At the table sat my youngest son James with my Bible open. He was spreading the pictures out on the table. He looked up at me in confusion and pointing to one of the dismembered children asked , “What is this?” Before I could say anything my daughter Victoria exclaimed, “That’s someone!” Her childish, innocent, and honest recognition of the reality that this photograph represented startled me. 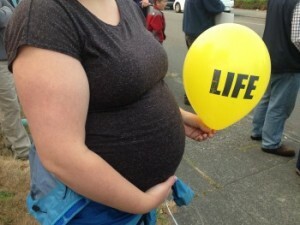 She didn’t say, “That’s a baby.” She didn’t say, “That’s a person.” Both of these statements would be correct. Instead she recognized that this baby, this child, is someone, just as she is someone. Her simple words unveiled a much more empathetic and profound understanding of personhood than I possessed. Surely it pleases God to hide these truths from the wise and to reveal them to babes. It is so easy to become jaded in adulthood. Children are not so far removed from the newness of life and the wonder of simply being. Every human being is made in the image of the one true God. We are all someone because He is. Victoria, James, and I sat at that table and talked for a long time. We cried and prayed together. They asked questions and I did my best to give answers. Though it was not my intention for my children to see those pictures at that time, I thank God that it happened the way it did. At the appropriate time and manner, as God leads, I believe it is right that we should talk to our children about the realities of the world that we live in. My experience has been that rather than causing anxiety and undue worry in our children it actually has the opposite effect. The comforting fact that they have a mommy and daddy that love and protect them and would never permit harm to come to them is reinforced. That God has redeemed mom and dad for such a time as this and has called us to lay down our lives for these little “someones” brings the heroic charge of the Gospel into reality. Indeed, an age appropriate and sensitive conversation about the evil of abortion can teach our children much. You may even find they have much to teach us.